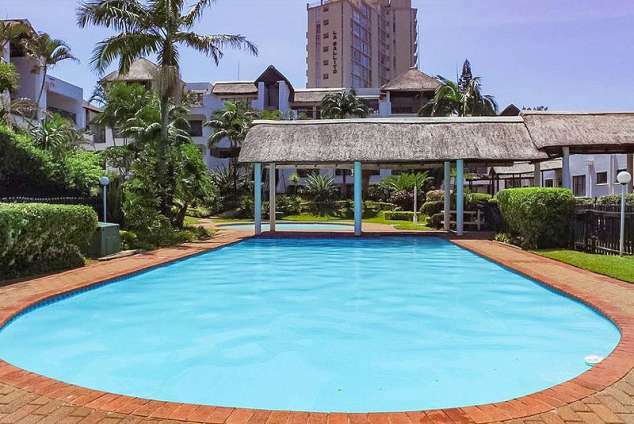 Unit 52 La Pirogue - Ballito Central Accommodation. La Pirogue is a well maintained & safe complex perfect for families. Lush gardens & manicured lawns surround the sparkling swimming pool with a splash pool for the little ones, which are on your doorstep. As well as a private forest area for the children to adventure in. Each unit has private remote access. This modern luxurious unit has all the amenities of home and is sea facing with slight sea views. With a fully equipped open plan granite kitchen. A diner with a 6 seater dining room table and sideboard. Open onto the lounge with 2 comfortable couches, coffee table, LCD screen TV, DVD player & DSTV connection. The open balcony leads off the lounge area and enclosed patio. The enclosed patio has great natural light with huge windows to take advantage of the sea air, with 2 two seater couches and coffee table. This unit has 3 spacious bedrooms with bedroom one having two single beds with side tables and dressing table. The 2nd bedroom has a queen size bed with side tables and dressing table as well as sliding doors onto a sea facing patio. Both bedrooms have remote controlled ceiling fans. The 2 bedrooms share the full modern bathroom with bath & shower. The main bedroom is very spacious with sliding doors onto the sea facing patio. This bedroom has a queen size bed with side tables, 42 inch TV, chest of drawers, standing air conditioning unit, standing fan as well as a remote controlled ceiling fan. Ample cupboard space with a built in dressing table. A walk through dresser into the en-suite modern bathroom with shower. La Pirogue is about 15 km from King Shaka International Airport. Within 2 minutes walking distance to the main beach, Spar and Mozambik Restaurant. Also directly opposite Ballito’s main hotel, La Montagne. Other restaurants in the vicinity are La Femme, Hops, Waterberry’s, Ocean Basket as well as the newly opened Ballito Junction Mall. Detail description : The complex is lovely for families with children. It is in walking distance to the beaches and shops , which is a must when having to carry sleeping little ones. The complex has a baby splash pool which is perfect for babies and little ones who cannot swim. It also has a small forest with overgrown lush vegetation and bridges that the children can go and explore and play in safety. 1694 page views since 28 Feb, 2018.